Description: The power for Q557 is show here at Courtland. It is parked without a crew because the Henderson Sub is out of service. This is because two freights sideswiped at the north end of the Goodlettsville passing siding the previous evening. Description: KCS SD50s 7009, 7011, and 7000 lead northbound KCS ballast train W-SHKC-30 through Poteau. Description: An SD50 poses for a roster photo at KCS' Dallas Yard. This locomotive was delivered to Conrail as SD50 6828 in February 1986 and after a stint in the NREX lease pool was picked up by KCS. Note the rearward facing horn near the number one radiator fan. 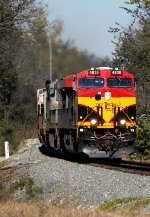 Description: Two SD50s idle with a freshly painted SD70ACe in the KCS Dallas Yard. Both SD50s are Conrail veterans, 7019 still has the Conrail type red marker lights intact on the rear painted over. Description: An H train rolls past the brick church at Baron on a Tuesday afternoon. The trees have grown up to the point where the building is cropped in quite a bit, a big change from earlier years. Description: The H train rolls south past MP 252 in this telephoto shot, working farther south by the minute. Description: Not on the soccer field. This 114 car H train has what has become a common event, a Belle leader. The score is the trailing unit, an SD 50. These units are often seen on work trains, but now only rarely on freight. This was quite a catch. Description: KCS 7009 leading a work train that's parked in a siding at Latanier, La. Description: Its still a good shot. The creek next to Mt Olive Rd just north of Dorsey is showing the effects of an active winter. Not so much snow, but a lot of rain, which has washed out all the vegetation from the stream bed. Lets see how green it gets this summer. An H train rolls north. Description: This northbound H train is getting underway from a meet at Gentry, moving from the siding to the main after rolling by an AEPX coal train. Description: The trailing unit on the H train was an SD 50. Not many of these still kicking around, though its not uncommon to see them in work train service in the summer. Description: KCS local train RAD102-28, also known as the Ashdown Dodger, has entered the main track at South Ashdown and rapidly accelerates as it begins the day's round trip towards Texarkana. The headlight in the distance belongs to an Arkansas Southern train switching at the south end of the KCS Ashdown Yard. Description: KCS local train RAD102-28, also known as the Ashdown Dodger, has entered the main track at South Ashdown and rapidly accelerates as it begins the day's round trip towards Texarkana.